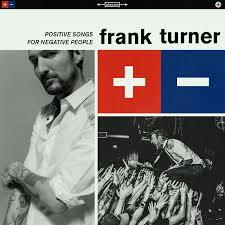 It's took me a while, but eventually I warmed up to Frank Turner in a huge way. Over the last year and a bit he's possibly been me favorite musician. Last week the British punk-poet released his latest studio album, Positive Songs for Negative People. Like much of his previous work, it's an album that grows on you with each listen. The folk tradition is front and centre on "The Angel Islington", which is in keeping with the like the '60s-era English troubadour style of the genre. A roots jangle dominates the infectious "The Opening Act of Spring" as well as the bounding "The Next Storm". The album's nightcap, "Old Flames", is an outstanding near-country male/female duet that leaves you with a warm feeling. The punk rock influence bursts forth in the form of the clattering anthem "Get Better". Turner hits breakneck speeds with the frenetic (and aptly titled) "Out of Breath". His vocals on "Love Forty Down" are a shot of gritty aggro punk. Turner also has a rare knack for straightforward melodic rock. Solid cuts like "Josephine", "Demons" and the mid tempo "Mittens" show that he can deliver in many different ways. It's downright motivational on the uplifting "Glorious You". The blue collar ethos of Turner is most prominent on "Silent Key". The lyrics could easily have been written by Springsteen, but when combined with the arrangement and performance it's unmistakably Frank Turner. If Positive Songs for Negative People does not grab you right away, just give it another spin or two. You will not regret it. Frank Turner plays Riot Fest in Toronto on September 20th. Best tracks: "Get Better", "Old Flames"